Setting high standards for Iran, brothers Noshad Alamiyan and Nima Alamian, have both enjoyed notable success in recent years. 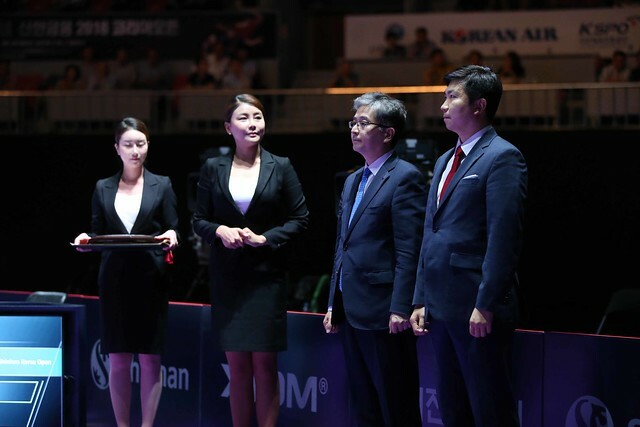 However, in the Men’s Singles qualification tournament that precedes the Seamaster 2018 ITTF World Tour Platinum Shinhan Korea Open; the opening day of play, Tuesday 17th July, was not one they may wish to remember. Noshad Alamiyan was beaten by DPR Korea’s An Ji Song (8-11, 11-9, 11-4, 1-11, 11-6, 11-4), who earlier in the day in his opening contest had accounted for Ecuador’s Alberto Miño (11-7, 8-11, 14-12, 6-11, 11-8, 11-7); thus first place in the group is secured. The end of the road for Noshad Alamiyan, for younger brother there is a ray of light. He was experienced defeat at the hands of the Korea’s Republic’s Choi Deokhwa in his opening encounter in six games (9-11, 11-8, 11-8, 10-12, 11-4, 11-6). However, in his first match of the day, Choi Deokhwa had lost to India’s Amalraj Anthony by a similar six games margin (11-9, 11-3, 10-12, 12-10, 6-11, 11-6). In order to top the group, Nima Alamiyan must beat Amalraj Anthony in five games or better, six games and it’s points ratio; anything else and farewell. Always competitive, Noshad Alamiyan and Nima Alamian attract the attention wherever they play, they always give total commitment; on the opening day of play one other player also attracted the attention, simply because of what he has achieved and his mercurial character. China’s Zhang Jike overcame Korea’s Republic’s Kim Byunghyeon in his opening encounter (11-2, 9-11, 11-3, 11-4. 11-8). Play in the qualification tournament concludes on Wednesday 18th July.